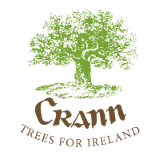 We are very proud and honoured to announce that Michael D Higgins, the President of Ireland, is now the Patron of Crann. The President accepted our invitation in March to become our Patron. President Higgins has a long and wellknown grá for all things to do with the environment, and trees in particular. He continued: “It is important for us all to recognise, appreciate and value the many benefits we reap from our forests and woodlands and to safeguard, maintain and enhance this valuable asset for future generations to derive benefits and enjoyment from. They are an enduring legacy. As Robert Browning said, “Generations pass while some tree stands”.